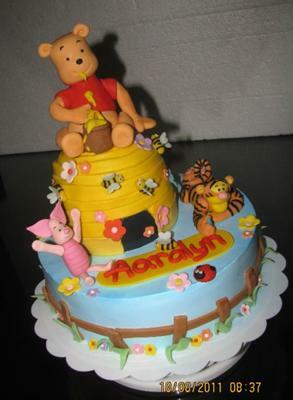 To make this Winnie the Pooh cake, I baked a 10 inches and a 5 inches half ball cake. I frosted the 10 inches cake with whipping cream/freshcream, and covered the ball cake with fondant. All the characters and decorations were made of modelling fondant in advance.